Laguna Beach will test a new emergency messaging system downtown at noon next Friday, May 4, which instead of sounding a blaring siren will play a recorded message alerting listeners of a test. 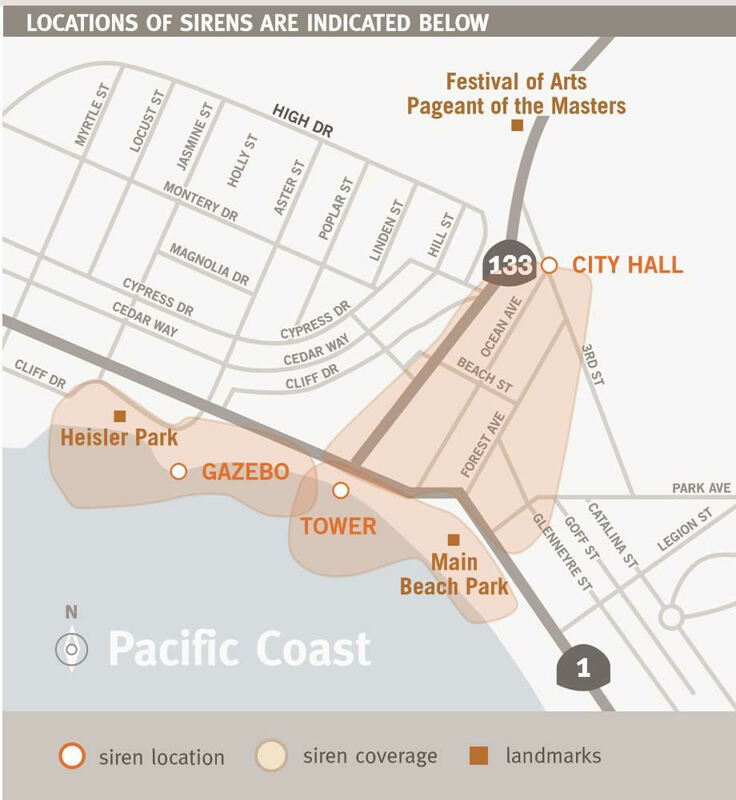 The warning message will be audible in a limited coverage area between Broadway Street and Laguna Avenue and across Main Beach and Heisler Park, said Jordan Villwock, the city’s emergency operations coordinator, whose voice will be heard coming from speakers at City Hall, Main Beach and in the Heisler Park gazebo. Instead of the more familiar warning siren, such as those once installed to warn a radiation leak from the San Onofre power plant, this system permits the delivery of verbal instructions in the event of a real emergency, Villwock said, such as direction to evacuate beaches due to a tsunami prediction. And the system may be utilized for all types of hazards or disasters where immediate action from the public is necessary, Villwock said. The city already encourages residents to register their landlines, cell phones and emails to receive emergency notifications. Through the Alert OC system, Laguna has about 18,000 contacts of businesses and residents, Villwock said. As landline use declines, reverse 911 calls have been a less effective at emergency messaging. To ensure that visitors in town also receive notifications in an emergency, Laguna will soon be able to send wireless emergency alerts to all cell phones that pick up cell tower signals throughout town, Villwock said. He said Laguna is the first city in the county to obtain approval from the Federal Emergency Management Agency to issue such emergency notifications through cell towers, similar to the Amber alerts issued by the California Highway Patrol. Authorization is needed, he said, “to try to prevent what happened in Hawaii.” An emergency missile alert accidentally went out to everyone in Hawaii in January due to an error by an employee pushing the wrong button. Cities of Huntington Beach and Newport Beach will also be testing their independent Outdoor Warning Systems at the same hour.